The 10 per cent vote share difference between BJP and Congress means a rout of the Ashok Gehlot regime in Rajasthan. 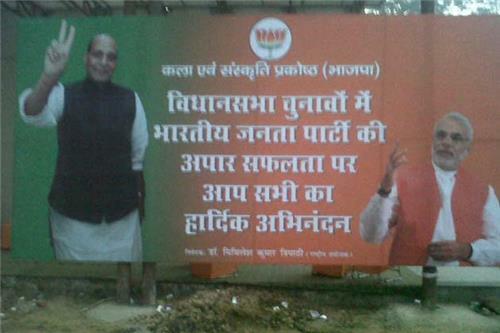 The BJP is optimistic and seems ready for celebrations. 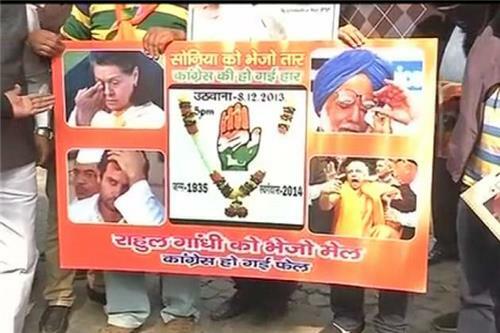 This is a picture taken outside the BJP office in Delhi early this morning. Delhi elections: A total number of 810 candidates are in the fray. 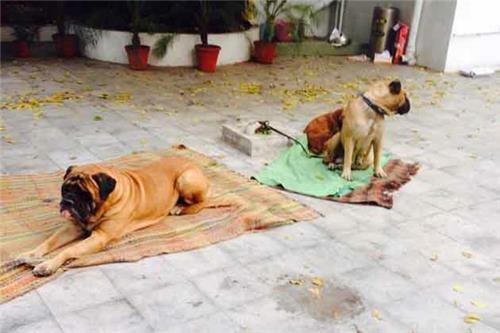 There is a tough competition between Arvind Kejriwal, Sheila Dikshit and Dr Harsh Vardhan. We may have done some things which people thought were impossible and we will continue to do them, says AAP's Yogendra Yadav. Madhya Pradesh: The fate of the 230-member Assembly election will be out today. Chief Minister Shivraj Singh Chouhan is likely to score another big victory for the third straight term. The Congress has been out of power in Madhya Pradesh since it lost elections in December 2003. All the four states have seen a record voting in this elections. The Aam Aadmi Party has won the Deoli seat by 17108. AAP's Prakash has defeated BJP Gagan Rana. Delhi elections: The BJP has won the Kalkaji seat. BJP's Harmeet Singh has defeated AAP's Dharambir Singh. BJP's Subhash Sachdeva has won the Moti Nagar seat, defeating AAP's Kuldeep Singh Channa by 16021 votes. A Delhi BJP poster says, "Rahul Gandhi ko bejo mail, Congress ho gyi fail"
AAP leader Shazia Ilmi has started leading in the RK Puram seat by 37 votes. BJP's Ramesh Bidhuri has won the Tughlakabad seat. Delhi elections: BJP's Ramesh Bidhuri has won the Tughlakabad seat. AAP's Jagdeep Singh has won the Hari Nagar seat against Akali Dal's Shyam Sharma by 8876 votes. Congrats @ArvindKejriwal for raising the ante & a great start. Raised expectations brings with it an enormous responsibility to meet them! AAP leader Manish Sisodia says that his party has no objection if the Lieutenant Governor allows a minority government. AAP leader Manish Sisodia says there is no question of his party forming any alliance with either Congress or BJP. "We will sit in opposition," says Sisodia. Final Rajasthan Assembly election results: BJP wins 162, Congress 21, Others 16. Rambir Shokeen, Independent MLA from Mundka, has said that he would speak to Narendra Modi and if BJP offered him Deputy Chief Minister post, he would join the party. Final Chhattisgarh Assembly election results: BJP 49, Congress 39, BSP 1, Independent 1. The live updates are over. We will be back at 8 am on Monday to bring you the Mizoram Assembly election results. Thank you for joining us. Chalfilh has been won by Dr Ngurdingliana of Congress by a margin of 3728 votes. Lalthanliana of Mizoram People's Conference is leading in Aizawl North - ii by a margin of 277 votes. Votes are still being counted there. Counting still on in Aizawl North - ii, Aizawl West iii, Lawngtlai East and Mamit. Of the eleven ministers who contested in the elections, nine - R. Lalzirliana (Home), JH Rothuama (Cooperation), PC Zoram Sangliana (Transport), H Rohluna (Forests), Lalrinliana Sailo (Health), Lalsawta (Education), Zodintluanga (Sports), PC Lalthanliana (Social Welfare), Veterinary Minister Nihar Kanti Chakma - have won. H. Zothangliana of the Congress party is leading by a margin of 83 seats in Lawngtlai East. No woman makes it to Mizoram House yet again. Three women candidates belonging to BJP were in the bottom, while the lone woman Independent nominee B Sangkhumi, former President of the Mizo Hmeichhe Insuihkhawm Pawl (MHIP) or Mizo Women Federation also suffered loss. The Election Commission is yet to give result of one single seat for which the counting is in process. As of now, the Congress party has won 33 seats and is leading in 1. Mizoram Democratic Alliance (MNA) has won 6 seats.